Wow your friends at your next get together by using candy molds and your favorite chewing gums to make custom-themed gum lollipops. Pick up an assortment of candy mold shapes at baking or craft supply stores and grab your favorite Wrigleyâ€™s gum before letting your imagination run wild! The finished creation can be bundled together for a beautiful and edible centerpiece or used individually as party favors! 1. Clean and dry plastic molds. Using vegetable oil or non-stick spray, lightly grease inside mold cavities. Set molds aside. 2. Unwrap and soften stick gum by kneading in the palm of your hand. The amount of gum you will need depends on mold size but start by kneading several sticks at a time and once soft, place and press firmly into mold cavity. If more gum is needed, repeat steps until mold is completely filled. The softer the gum the better. Try a brand like Juicy Fruit for best results. 3. 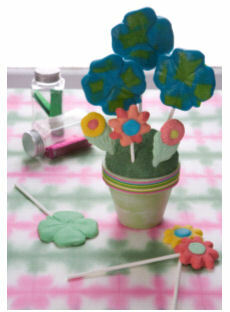 To transform molded shapes into lollipops, lay sticks along the back of the mold and cover with additional pieces of softened gum. 4. Once molds are filled and sticks are in place, give each a final press and place in refrigerator for about one hour or until gum is completely hardened. Once chilled, remove plastic molds, gently ease gum shape from cavity and enjoy!